"Each volume comprehensively covers parts identification and applications with charts galore, and it's chock-full of GM archival photos, blueprints, and diagrams. If you want to know what Chevy used which part, this is the place to look." 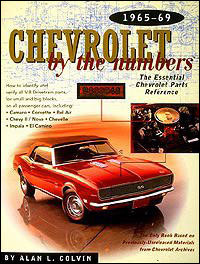 Chevrolet By The Numbers is an authoritative reference for identifying and verifying, by casting number, the correct Chevrolet V-8 engine and drivetrain parts for your exact model. Part numbers can tell you what parts fit, but they can't tell you what part your car was originally manufactured with. 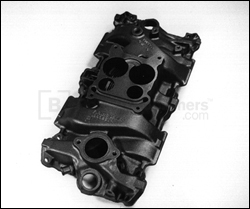 Only casting numbers can tell you what a part's exact model and year application is, when the part was manufactured, and which plant made it. This book shows you where to look for casting numbers on parts and how to decipher their codes so you can be sure you have the correct part for your car. Only Chevrolet By The Numbers documents part casting numbers and applications using original source material from Chevrolet's archives. No other book has this authoritative factory information, including photographs, engineering blueprints, technical service bulletins, and build sheets. Most of this information has never before been seen in public. Restoring your Chevrolet to original factory specifications? You'll find the casting numbers that correspond to your car's Vehicle Identification Number to help you avoid buying the wrong parts. Buying a car? You'll find how to tell if it really is a "matching numbers" car. Interested in Chevrolet history? There are fascinating stories that explain everything from mid-year running changes to production idiosyncrasies. If you absolutely want to know the original part numbers for your Chevrolet drivetrain - not just what interchanges or fits - but the correct part that came with your car when it rolled off the assembly line - Chevrolet By The Numbers has the answer. 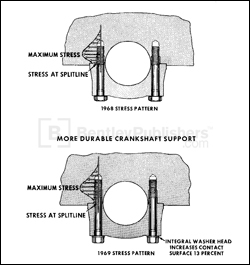 Diagram from 1969 Passenger Car Preliminary Features details 1968/1969 main bearing crankshaft support changes. View of #3932461, drilled and tapped for A.I.R. Non-A.I.R. version has bosses, but they are not drilled and tapped.